love the red with the grey, what a nice combination. This dress is gorgeous! Its the first day of my summer to can't wait! These photos are beautiful, what a great location! Your outfit is so nice, I love your hat!! You look super gorgeous in that outfit. Of course you look gorgeous in these photos (kudos to pops for being such a great shutterbug) but let's talk styling. AWESOME. you put together a grand ensemble that is very mod and '60's, even the color combo fits perfectly in that era. The fact that you actually consider what type of poses to do makes for even more admiration from me, and yes, your stance harkens back to the Ginger Girls and Miss Twiggy. Well done! Again! Such talent! You really do have quite the knack of putting things together so well!! And your photographers...just fantastic :) You should have your own magazine or something. I am loving this outfit. LOVE. And my summer is going to be full of walks to the beach in bohemian goodies, redecorating our bungalow, and a joint venture with another blogger. Happiness! You look so beautiful in red and I love your cool heat. You look absolutely amazing in all of the shots but I especially love the first one. Your pose is incredible, it's so simple yet it looks amazing next to the path veering the opposite way. I really like the striking red dress that stands out so much against the different shades of green of the foliage. Glad you enjoyed your internships. Thanks for your comment, I'm definitely going to look into getting a vintage vanity case for my stylist kit, what a great idea. I can't wait to hear about what you have planned for summer, I'm sure you'll get up to lots of creative adventures. I love how the red and grey complement each other, the simple cut of the dress, and most of all, the hat plus side braid - so perfect! What a gorgeous outfit! 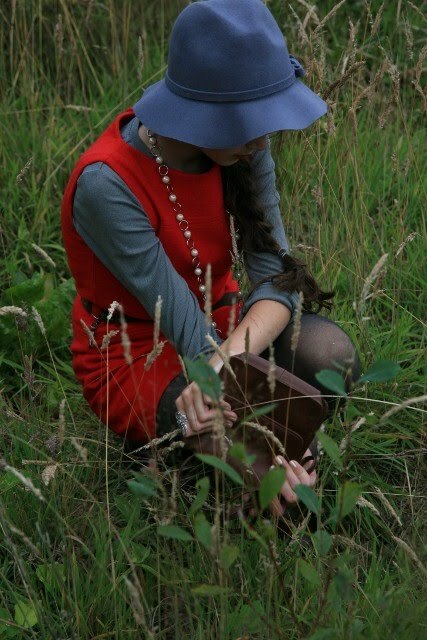 I love the red shift dress and the hat is wonderful too. Great photos! You are just stunning, and I really love the combination of red and gray. your body language is fantastic..
any camera would love that. Cute red dress, you look lovely! lovely photos as always! I love your red and blue ensemble, the second last photo is my favourite! I love that pop of red with the neutrals. Fantastic! How did you get to watch The Red Shoes on big screen? I think is a great movie I can't believe you're only starting your holidays while I have to go to school in just two more weeks and the summer is almost gone, my advice is: have a lot of fun, be creative and enjoy everyday because before you realize your free days are gone ( Kind of what happened to me). Happy Vacations! Delightful outfit, love the red. You write so eloquently too! I study in Bristol - please do share the name of the vintage shop, I'm always looking for new places to visit! This hat is dreamy!! It suits you so well! I love the stand out red its amazing and looks great on you. The pearls are gorgeous too and I love the vintage floppy hat! Overall brilliant look!